Rackspace cloud solutions are backed by fanatical support. It offers a flexible cloud environment and persisting Cloud service experience. Rackspace Cloud server is backed by OpenStack Cloud platform and you are free to develop software according to your requirements. The cloud solutions are suitable for individuals, small business set up and large business enterprises. It offers all kinds of Cloud solutions that include Cloud hosting, Managed & Hybrid hosting. Rackspace is a global leader in Cloud solutions. Openstack based Cloud platform offers flexible networking environment with fast bandwidth, customizable data storage, freedom to work on an operating system of your choice and pay as you go billing facility. Rackspace's secure flexible features also include Spot Instances, Elastic load balancing, Automated Backups, Elastic IP address, Data encryption, API access, On Demand Instances and Server coloning. Rackspace Cloud service can be easily integrated with mobile applications, accessed on Desktops, Netbooks, Tablets, iPads, iPhones and Smartphones. Rackspace's diverse cloud solutions include web hosting 101, managed private cloud, Cloud server, Cloud sites, Cloud files, Cloud control panel, E-mail hosting and other hybrid cloud solutions. Rackspace solutions are useful for e-commerce portals, corporate websites, rich media sites, software testing and development. The offered Cloud solutions are highly cost-effective, power saving and can be customized according to requirements. With Rackspace Cloud block storage, users can store infinite data. Rackspace offers 1 public IP for each user instance and reverse DNS facility. The global Cloud leader offers 100% Cloud uptime, strong security tools and 24 hours available customer support with fanatical support. 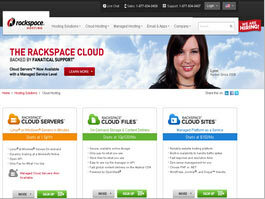 Rackspace Cloud Hosting Review - website owners trust Rackspace, the open cloud company. Get cloud, managed and hybrid hosting all backed by Fanatical Support.